As a family-owned business, Patio Place takes pride in offering Irvine the best prices on brand patio furniture, umbrellas, bar stools, gas logs, barbecues, fire pits, fire tables, and more. For more than 25 years, we have been negotiating incredible deals on the names you trust most, including Patio Renaissance, Hanamint, Galtech, Alu-Mont, Ratana, Sunset West, Telescope, Treasure Garden, Kings Rattan, Fire Magic, and R. H. Peterson. Whether we're purchasing river rocks and reflective fire glass in bulk, receiving great deals on off-season fire pits and patio umbrellas, or receiving closeouts on the previous year's patio furniture lines, our mission is to give our Irvine customers access to the finest quality merchandise at the lowest prices in Orange County. We even help our customers save money with our repair services for old, used, damaged, and worn patio furniture and equipment. Our comprehensive services include custom-fabricating replacement slings, cushion, and pillows; refinishing patio furniture frames; replacing common barbecue parts; custom fabricating protective covers; and repairing patio umbrellas. Whatever your needs, you can be sure that we will always put your best interests first. Our knowledgeable and friendly employees will help you to perfectly match your existing decor, stay under your budget, order custom-made patio furniture, fabricate tailor-made protective covers, silk screen your existing umbrellas, deliver your purchases the day you buy them, and more. They are highly experienced and have the industry expertise to make sure you go home happy. The dedicated team at Patio Place has helped thousands of commercial and residential customers throughout the wider Orange County area. 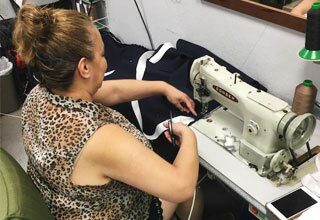 They even specialize in accommodating large commercial orders: they will take samples and prototypes to your Irvine site, and empower you to make informed decisions for your restaurant, spa, hotel, yacht club, or other business. With low pricing, quality selections, and superior customer service, Patio Place offers Irvine the best value for patio furniture, bar stools, umbrellas, fire pits, and more. Continue reading to learn more, or visit us today. Visit us seven days a week to view our huge inventory of affordably priced, brand name patio furniture, bar stools, BBQ grills, gas logs, fire pits, awnings, umbrellas, and more. We are conveniently located near Irvine in Costa Mesa at 845 Baker Street (between Bristol and Bear). 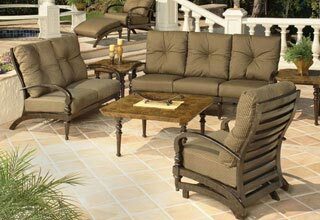 When you choose Patio Place, you can be sure that you're getting quality patio furniture at affordable prices. We sell and deliver the market's finest extruded aluminum, cast aluminum, and wicker patio furniture from Sunset West, Patio Renaissance, and other top brands. At our showroom, we offer a huge selection of outdoor dining chairs, picnic tables, swings, loveseats, sofas, benches, bar stools, deep seating, sectionals, chaise lounges, patio tables, patio chairs, lounge beds, ottomans, and more. We also stock over 600 fabrics from Sunbrella, Phifer, and top patio furniture manufacturers, which are perfect for restoring or upgrading outdoor cushions, pillows, slings, and straps. With great service, low pricing, quality repairs, and same-day delivery, we are Irvine's best choice for all of their patio furniture needs. Visit today. At Patio Place, we sell fire pits, fire tables, bar stools, and dome covers from the industry's best brands, including Hanamint, OW Lee, and Alumont. Our extensive selection is available for the best prices in Orange County, including Irvine, and we can provide you with same-day delivery of most of our inventory. 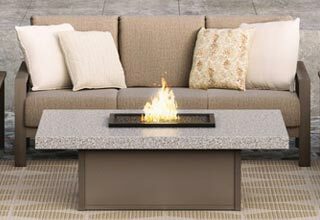 At our showroom, you'll find fire pits and fire tables in various styles and designs, including our marble, slate, cast aluminum, and granite fire tables. We also stock common fire pit accessories, such as fire pit domes, ceramic gas logs, reflective fire glass, river rocks, and more. And, because no fire pit is complete without patio seating, we offer patio chairs and barstools in a number of attractive and complementary styles. Call us today to learn more. Patio Place sells and delivers quality patio umbrellas from leading brands, such as Galtech, NorthCape, and Treasure Garden. 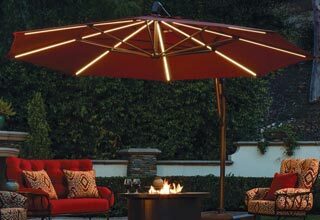 We carry all types of patio umbrellas, including auto-tilt umbrellas, cantilever umbrellas, easy-track umbrellas, push-to-tilt umbrellas, side post umbrellas, lighted umbrellas, and more. We also sell umbrella accessories, such as hanging umbrella lights in both plug-in models and solar-powered models, and umbrella bases in varying weights and styles. Visit us today to speak with our patio umbrella sales experts or call to learn about our patio umbrella restringing, recovering, silkscreening, and rib replacement services available to those in Irvine. Whatever your outdoor cooking needs, we can help. Patio Place provides Irvine homeowners and business owners with top-quality barbecues, grills, range hoods, kegerators, fridges, access doors, gas logs, and more, all for incredibly low prices. We stock propane barbecues and grills from Fire Magic, which are available in various sizes and easily converted to natural gas. We also carry top-of-the-line gas logs from R. H. Peterson, which are energy-efficient and available in countless styles. We can deliver and install most of the barbecues, gas logs, and accessories we sell, including hooking them up to your gas line for you. Call or visit us today to learn more.